Chicken-based recipes are a recurring theme in our household. It's about the only meat the husband will reliably eat. And pretty much, if a new recipe contains chicken, he's open to trying it. Hence my decision to do chicken two days in a row. For some strange reason, he always used to order Chicken Chow Mein and Special Fried Rice from the Chinese. Every time he did it, he'd complain that he had too much food (we never have 'sharing' Chinese) and eventually he braved a Chinese Chicken Curry and has never looked back. 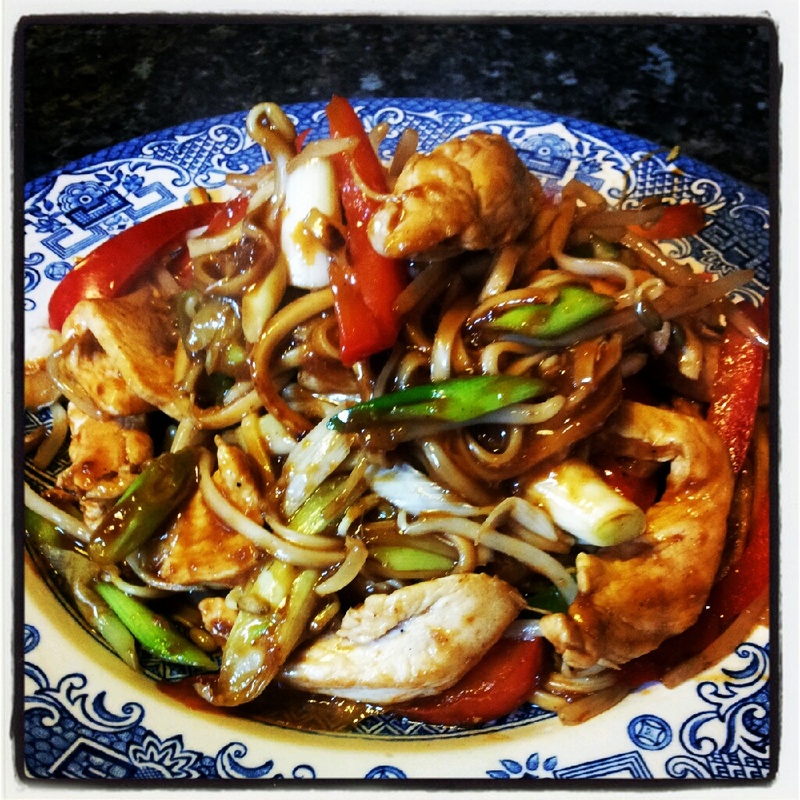 One of my early thoughts for things to do on this blog was to have a go at 'Fake-away' (homemade versions of takeaway meals). I had one hit with Singapore Noodles and on less successful attempt at Salt and Pepper Chicken. Since then I've not tried anything else. So this seemed an ideal crowd pleaser. I found it under the Kids Cooking section of the BBC Good Food website and even though Miss A is too small to help prep and cook it, I'm hoping she might try it as it comes with noodles which she does like. Due to holidays, this is another pre-authored blog so do check back for an update with a picture and a verdict. It got eaten. The hubby's complaint was that it was a lot of the same - which is true. Because it's all mixed together and there's not much complexity to the flavour. Which is odd. Because that's how all the meals he enjoys normally are. I think he had an issue with it being healthy and not having a huge pile of bread on the side - which is how he normally eats his food. This was the first signal that the eight-week healthy eating plan is going to be more stressful than I'd first anticipated. I'm not sure that he is really taking the health kick seriously....watch this space.